Mario using his forward smash in Brawl. A forward smash, abbreviated f-smash and officially known as a side smash attack (横スマッシュ攻撃), is a smash attack that any character can perform by tapping the control stick (or d-pad in Super Smash Bros. 64) in a horizontal direction and pressing the attack button immediately afterward or simultaneously, or by tilting the C-Stick in a horizontal direction. Starting in Melee, forward smashes can be charged for a maximum of one second (or 60 frames), resulting in up to 40% higher damage and knockback. After tapping the control stick forwards, there is a 3-frame window wherein a forward smash can be performed. If the attack button is pressed too late, a dash attack will be performed instead. Pressing the attack button on the last possible frame results in a small step forward smash. In all games except Super Smash Bros. Brawl, forward smashes can be pivoted. Like forward tilts, certain forward smashes can be angled in up to 3 directions; a select few forward smashes in Smash 64, however, can be angled in up to 5 directions. In Smash 64 and Melee, the control stick or c-stick must be tapped in the desired angle at the start of the move to angle it. In Brawl and Super Smash Bros. 4, however, the attack can be angled by holding the control stick or c-stick in the desired angle as the move's charging period ends. The c-stick can not be used to perform forward smashes in the single-player modes of Super Smash Bros. Melee, as it instead is used to move the camera. 1 List of forward smashes in Super Smash Bros. List of forward smashes in Super Smash Bros.
Link Slashes from top to bottom. Deals good damage and has long reach. 20% (center), 8% (tip). Deals 24% in the PAL version. Bowser Headbutts forward. Noticeably long start-up, but is the strongest smash attack in Melee. 24%. Captain Falcon Thrusts his elbow forward. Good knockback with a flame effect, but considerable starting lag. The third strongest forward smash in the game. 20%, deals 1% more angled up and 2% less angled down. Donkey Kong Claps forward with high range and great knockback. 20%. Dr. Mario Extends his palm, unleashing an electric blast. Similar to Mario's forward smash, but has more knockback, less range, and has no sourspot. 19%. Deals 1% more angled up, and 2% less angled down. Ganondorf Lunges forward with an elbow thrust, much like Captain Falcon. Deals high damage with a darkness effect, and is the second-strongest forward smash in the game. 22%, deals 2% more angled up and 3% less angled down. Ice Climbers Smash both hammers in front of them. High damage and knockback, dealing more damage than Bowser's if fully charged and if both Climbers hit. 14% leader, 13% partner. Link Slashes forward. A second, stronger slash can be performed by hitting the A button or C-Stick immediately following the first. High reach on both slashes. The first hit's high knockback growth prevents it from comboing into the second, stronger hit past 30%. 14% then 13%. Luigi Performs a horizontal spearhand. Very quick, and has the highest knockback scaling of all forward smashes, making it weak early on but deadly at higher percentages. 13%, deals 2% more angled up and 1% less angled down. Mario Releases a blast of fire from his extended palm. Poor range, yet very powerful and quick, with the fireball sweetspot dealing more damage and knockback. 19% sweetspot, 14% sourspot. Deals 1% more angled up, and 2% less angled down. Marth Slashes quickly from top to bottom, with a powerful sweet spot at the sword's tip. It is very fast and has high range. 20% tipped, 14% base. Peach Swings with one of three weapons - a golf club, tennis racket, or frying pan. All three have a disjointed hitbox. The racket sends opponents flying horizontally stronger than the others, yet is the weakest damage-wise. The frying pan deals the most damage and launches opponents vertically. The golf club is the weakest in terms of knockback and only deals slightly more damage than the racket, yet it has the longest range. Frying pan 19%; Tennis racket 14%; Golf club 15%. Pichu Releases electricity from its cheeks. Similar to Pikachu's, but with less range, and hits multiple times with the last hit dealing high knockback. 6 hits: 15% total. Roy Performs a high-range vertical slash. Similar to, but slightly slower than, Marth's. Deals incredibly high knockback, but is much weaker at the tip. 20% center, 13% tip. Samus Punches forwards with her arm cannon. Quick, but not particularly strong. 14%, deals 2% more damage angled up and 1% less angled down. Sheik Performs two rolling kicks forward. The first kick usually leads into the second, which does decent knockback. 6% then 9%. Yoshi Slams horizontally with his head. Some start-up lag, but good knockback. Yoshi's head is intangible for a short time during the attack. 16%, deals 1% more angled up and 2% less angled down. Young Link Like Link's, this smash has a second available hit. This one is a bit faster with more horizontal knockback. The first hit is also weaker, so it is easy to trap foes and land both hits. 10% then 7%; 17% total. Zelda Zaps the foe with magic from her extended hands. Somewhat quick with slightly disjointed hitbox. Multiple hits. 5 hits: 15% total. Zero Suit Samus Whips forward with her plasma whip. Has noticeable startup lag and is weak, but has fantastic range, even capable of hitting behind her. 10%-14% (front), 6% (back). Little Mac Leans forwards and throws a punch. The move changes when it is angled. Angled up: Becomes an uppercut with deceptively large reach. No angle: Punches forward with very good KO power. Rosalina & Luma Rosalina: Thrusts her hands forward, hitting the enemy with a galactic blast. Luma: Delivers a powerful straight punch. Decent range, high knockback, and can KO at 90% when the two overlap. Bayonetta Uses her hair to summon the fist of Madama Butterfly for a massive punch. Bowser Peforms a dropfoot kick. Extremely powerful and long ranged with the strongest hit being on his feet. Captain Falcon A powerful backhand punch that can be angled upward or downward. Charizard Swings it’s head sideways with powerful knockback. Chrom Does a powerful sword swing with a similar animation to Roy, though has consistent power. Cloud Performs three sword swings. High start-up and endlag but deals great damage and knockback along with immense shield-damage. Corrin Extends his/her dragon arm forwards. The attack has hit boxes while charging and Has incredible range with the sweet spot at the tip of Corrin’s fingers. Dark Pit Identical to Pit. Dark Samus Mostly identical to Samus with a different animation. Diddy Kong Does two punches while jumping in the air. Deals strong knockback. Donkey Kong Claps his hands together. Very strong in every regard along with good range. Dr. Mario Same as Mario's, but has the sweetspot reversed with electricity instead of flame. Stronger compared to Mario’s. Duck Hunt NES Zapper fires three times in front of the duo. Decently strong and long ranged though has some startup. Falco Performs a two-handed overhead swing with his wings. Fox Does a leaping kick forward. Ganondorf Performs a slow but extremely powerful two-headed overhead sword swing, similar to Ike. Greninja Quickly swipes a water blade forward with decent knockback. Ice Climbers Slams their hammers onto the ground in front of them. Very strong with both climbers present. Ike Does a very slow but strong overhead sword strike. Incineroar Performs an enzuigiri kick, Incineroar will gloat and spread out its arms if it hits opponents. The sweetspot of the move is at its foot and when landed, deals massive knockback. By far the strongest smash attack with revenge, capable of killing at around 20% and dealing almost 60%. Inkling Swings an inkbrush forward. Good knockback if Inkling has enough ink in her/his tank. Isabelle Pops a party popper in front of her. Deals strong knockback. Ivysaur Plants its vines on the ground and lunges its body forward. Good knockback. Jigglypuff Kicks in front of itself with forward momentum. Decent knockback. Joker Does an overhead knife swing forward. When Arsene is present it is significantly stronger overall. Ken A quick roundhouse kick that has a sweetspot on the top of Ken’s foot. King Dedede A slow but immensely powerful overhead hammer swing. One of the strongest smash attacks in the game and can also break shields very reliably. King K. Rool Wears a boxing glove and does a single slow powerful punch in front of him. The move deals massive knockback when opponents are struck directly at the boxing glove. Can be angled. Kirby Kicks in front of him with forward momentum. Powerful knockback though has some endlag. Link Does a forward sword swing and trusts sword outward if the button is pressed again. Very strong and can throw out a sword beam projectile if link is at 0%. Little Mac punches straight forward with some momentum. Very fast and strong with decent range. When angled upwards, he does a a strong Uppercut and when angled downward does a gut punch that has minimal knockback but immense damage and shield-damage. Lucario Trusts palms forward unleashing aura. The power of the attack varies greatly depending on Lucario’s damage percentage. Lucas Swings a stick in front of him. It reflects projectiles like Ness', and the hitbox comes out faster though is not quite as powerful. Lucina a quick overhead sword swing. Identical animation to Marth’s though has consistent power. Luigi Peforms a horiziontal spearhand that deals strong knockback. 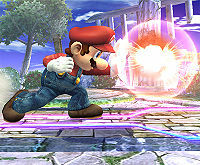 Mario Thrusts his arms and lets out a explosive blast. Very strong when hit at the flame. Marth an overhead sword swing. Not particularly powerful at the base, but very strong when hit at the tip. Mega Man performs a charge shot. The size of the attack increases when charged. Can be reflected due to being a projectile. Meta Knight swipes sword in front of him. Surprisingly strong for its speed. Mewtwo Trusts it’s palms forward creating a blast of dark energy. Powerful when hit at the dark energy. Mii Brawler punches forward with momentum. Slow, but very strong. Mii Gunner A long ranged rapid-fire shot of energy from his/her arm cannon. Has excellent range with decent knockback, making it a reliable kill move from a distance. Mii Swordfighter A sword swing forward. Mr. Game & Watch thrusts a torch forward referencing Fire Attack. Very strong when hit at the flame. Ness Swings a baseball bat in front of him. The move is at its strongest at the tip of the bat, the hitbox comes slowly, and can reflect projectiles. Olimar Has a Pikmin charge forward. Power and range differ depending on which Pikmin he uses. Can be reflected due to being a projectile. Pac-Man Throws the ghost Blinky in front of him. Good startup and power with a bit of endlag. Palutena Grows a pair of wings and thrusts them forward. Strong knockback and has a windbox in front of the wings that can potentially gimp opponents or prevent punishments. Peach Swings a bludgeoning weapon. Unlike in previous games, the weapon used is determined by the angle the left stick is held. Upward angle for the frying pan, no angle for the golf club, and downward angle for the tennis racket. Pichu Creates a shock of electricity from its cheeks similar to Pikachu, except it does multiple hits, has higher knockback, and does some recoil damage to Pichu. Pikachu Creates a shock of electricity from its cheeks. Pit Swings one blade and then the other. Piranha Plant Peforms a swinging headbutt while transforming into a Prickly Piranha Plant. Very powerful when hit at its head. Ridley Breathes out a blast of fire. Incredibly powerful with surprisingly low endlag. R.O.B. Shoots a small laser beam out of its head. Robin Thrusts his/her sword forward. Very strong with the levin sword though weak with the bronze sword. Rosalina & Luma Rosalina creates a small galaxy in front of her whereas luma punches forward. Rosalina’s deals higher damage whereas Luma’s deals higher knockback. Very strong if combined together. Roy Powerfully swings his sword forward. Deals devastating damage and knockback when hit closer to Roy, though very weak at the tip. Ryu Does a Joudan Sokutougeri kick. Sweetspot is at Ryu’s heel. Samus Thrusts her arm cannon forward. The sweetspot is at the fire blast. Sheik Quickly kicks twice with forward momentum. Shulk Thrusts the Monado forward then unleashes the sword’s beam blade. Simon Readily aims the vampire killer than lashes forward. Can be angled upwards or downwards and has incredible range and knockback. Snake Fires an RPG at the ground in front of him. Has very long startup but is devastatingly powerful. Sonic A quick wind-up punch in front of him. Has strong knockback and surprisingly disjointed range. Squirtle Swings it’s head forward spitting out water. Toon Link Vertical slash. Only one hit, but a giant hitbox. Villager Drops a bowling ball. It's slow, with low range, but has high knockback and functions as a projectile. Useful for edge-guarding opponents recovering below the stage, and can also be used after a down smash. Wario Does a enlarged backhanded punch. Incredibly strong though quite punishable. Wii Fit Trainer Does a warrior pose with forward momentum. Strong knockback though fairly punishable. Wolf Thrusts his hand forward. Has some startup but great knockback and surprisingly low endlag, making it a great shield pressure tool. Yoshi Swings his head before thrusting it into the opponents. Young Link an overhead swipe optionally followed up by a powerful swing. Similar to Link though less powerful and lacks the sword beam. Zelda Unleashes Magic from her hand. Very strong with good startup. Zero Suit Samus Two roundhouse kicks with forward momentum. This game is notable for all characters having very powerful forward smashes. Kirby's forward smash is both the fastest and strongest in the game, while having far range. Ness' forward smash is able to reflect projectiles. Bowser's forward smash is the most powerful smash attack in Melee, capable of KOing around 15% to 38%, and dealing 32% fully charged. It sends the Sandbag farther than the Home-Run Bat at certain percentages. Falco's forward smash is widely considered the second best in the game because of its power, lasting hitbox, and lack of a sourspot. Link and Young Link's forward smashes have a second hit that can be performed by pressing the attack button again after completing the first slash. Marth is widely considered to have the best forward smash in the game due to its speed, power, and range. Its sourspot, though large, KOs at reasonable percents, while its sweetspot KOs at extremely low percents. Peach's forward smash involves one of three randomly chosen weapons, each with varying range, damage, knockback, and angle, and also has a slight range behind her. Sheik's forward smash is notable for being one of the overall weakest smash attacks in the entire series. Ike's forward smash is the second strongest in Brawl. Although it doesn't deal as much damage as a few of the strongest characters, it has the highest knockback scaling and extremely long range, though this is counterbalanced by considerable start-up (about 30 frames) and ending lag. King Dedede's forward smash KOs earlier than any other smash attack in the entire series. Lucario's forward smash, as with its other smash attacks, produces a small-ranged aura blast from its paws, allowing it to attack from a small distance. It is nearly unpunishable if spaced correctly, even when shielded. It is especially powerful at high aura. Meta Knight's forward smash is his slowest move in terms of startup, but has extremely low ending lag. Olimar's forward smash, as with his other smash attacks, is a projectile where Olimar throws a Pikmin. Wario's forward smash is among the strongest and fastest in the game, while also having transcendent priority and granting him armor. Wolf's forward smash sends him a considerable distance forward and has minimal start-up lag. Corrin's forward smash outranges all other uncharged forward smashes in the game; proper spacing makes the move very difficult to punish. It's also the only forward smash in the series capable of dealing damage while being charged. The range of Duck Hunt's forward smash increases as it is charged, similarly to their other smash attacks and Snake's up smash. The properties of Little Mac's forward smash uniquely change when it is angled. It is a standard punch if not angled, and an uppercut with a larger hitbox if angled upwards. If angled downwards, it is a body hook that deals higher damage and shield damage, but lower knockback. Like all other of Little Mac's smash attacks, this move has super armor. Mega Man has one of the only projectile forward smashes in the game, and it increases in size, travel length, and power as it charges. When fully charged, it is the longest-ranged forward smash in the game. Mii Gunner's forward smash has the second longest range in the game and deals multiple hits, making it a potent tool for catching air dodges and rolls. However, it lacks KO power. Shulk's forward smash is the third longest-ranged in the game. It comes out fast and deals considerable knockback, but has notably high ending lag. Rosalina's forward smash is fast, powerful, and has transcendent priority, which makes it difficult to counter. Roy's forward smash is arguably one of the most feared due to its relatively quick start up and devastating KO power, able to KO at 30% on some characters with rage. However, it has noticeable cool-down, making it punishable if whiffed. Villager's forward smash is a projectile that can be dropped off of ledges, allowing him to edgeguard without leaving the stage. However, since it is a projectile, it can be reflected or pocketed by another Villager. Wii Fit Trainer's forward smash is one of the only forward smashes in the series that hits on both sides with good power. Like in previous games, there are notably long-reaching forward smashes: the four highest-ranged ones are Simon/Richter's, Corrin's, Mii Gunner's, and Shulk's. The Mii Gunner's forward smash retains its high range from the previous game, but has been buffed substantially in damage and knockback. It is now an effective attack for catching dodges or challenging shields from afar, and can even KO at 122% from the middle of the stage. Mr. Game and Watch's forward smash has fast startup, a disjointed hitbox, and deals extremely high knockback for its speed. Kills most characters at 65% by the ledge. Ganondorf's forward smash has given a complete overhaul, using his sword from the Space World 2000 tech demo. It has improved range and knockback. KOs opponents at around 65% from the center of the stage. Incineoroar can use revenge to have the highest damaging smash attack in the series, at around 50% of damage. Sonic's forward smash is known for its rather huge hitbox that outranges Luigi's tether grab. This page was last edited on April 25, 2019, at 02:32.